In spiritual matters, the Fool means idea, thought, spirituality, that which endeavours to transcend earth. In material matters, it may, if badly dignified, mean folly, eccentricity, or even mania. But the essential of this card is that it represents an original, subtle, sudden impulse or impact, coming from a completely strange quarter. All such impulses are right, if rightly received; and the good or ill interpretation of the card depends entirely on the right attitude of the Querent. 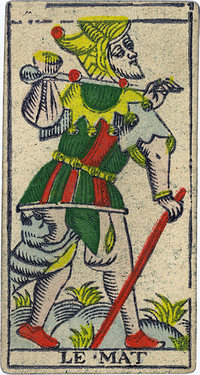 One cannot fail to recognize the Fool in this card, with his crazed look, and his apparel furnished with shells and bells: he goes very quickly, as mad as he is, bearing behind him his small pack, and thinking to escape thereby from a tiger which bites him on the haunch: as for the pack, it is the emblem of his faults that he wishes not to see; and this tiger, those of his regrets which follow it eagerly, and which jump in to bite behind him. This beautiful idea that Horace framed so well in golden words, would thus never have been invented by him, had it not escaped destruction with the Egyptians: it would have been a vulgar idea, a commonplace; but captured in the eternal truth of Nature, and presented with all the graces of which he was capable, this pleasant and wise poet seemed to have drawn it from his own deep judgement. As for this ATU, we number it zero, though it is placed it in the order of cards after the twenty-first, because it does not count when it is alone, and possesses only the value that it gives to the others, precisely like our zero: showing thus that nothing exists without its folly. 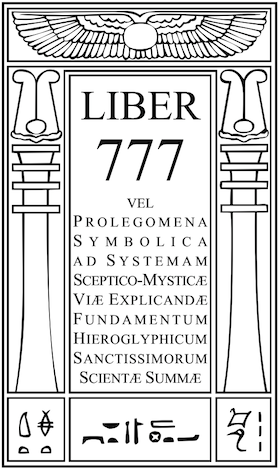 Sephirothic Geomantic Figures follow the Planets. Caput and Cauda Draconis are the Nodes of the Moon, nearly = Neptune and Herschel respectively. They belong to Malkuth. The Prince of the Chariot of Fire. Rules 20° d to 20° f, including most of Leo Minor. The Court Cards of the Tarot, with the Spheres of their Celestial Dominion—Swords. The Court Cards of the Tarot, with the Spheres of their Celestial Dominion—Pantacles.